he's rolling all over the place! sitting isn't something he's interested in, at the moment. when you sit him on his bum, he lunges forward on his belly. and boy, can this baby eat...still nursing every three hours plus 1/2 cup of pureed food twice a day. he's been chowing down on yellow squash and carrots. i thinking about giving him a haircut. poor guy, i was his hair would grow out. i always wanted a little boy with long hair. not sure that's going to work out. it's starting to look like an overgrow for a combover. 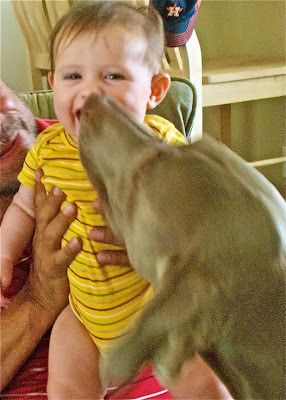 this month, LO has had lots of hugs and kisses from grandparents...and Dewey.